At Sanders, Wright & Freeman, we’re committed to respecting and protecting your privacy. 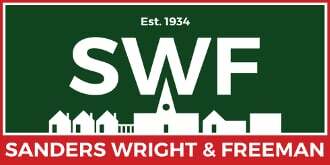 Sanders, Wright & Freemanis a trading name of Sanders, Wright & Freeman Ltd whose registered number is 9553664 and registered office is 13 Waterloo Road, Wolverhampton WV1 4DJ. We may share your information with relevant third party business partners. Where we engage third party service providers to provide products such as mortgages or other business services and operations, we provide them with only the personal information they need to perform the service we request. We contractually require them to securely protect information, and not to use it for any other purpose. When we use third party service providers, we disclose only the personal information that is necessary to deliver the service. To exercise any of these rights, email us atenquiries@swfestateagents.co.uk or write to us at 13 Waterloo Road, Wolverhampton WV1 4DJ. In addition, you can exercise your right to object to direct marketing at any time by clicking an ‘unsubscribe’ link at the bottom of one of our emails.